Do you have to be a member of a Church to have a funeral service? No. Rev. Daniel Brits is a non-denominational Minister. His services are available to anyone. How does he view a funeral service? As a celebration of the life of the deceased and the beginning of a new journey. Yes. It is his policy to meet with the family before the service. His goal is to learn all he can about the deceased so that the service can be centred on the meaning and memory of his/her life. Are services always religious in nature? No. every service is tailored to meet families’ needs. What is the best way to have a service? The "best" is what fits the deceased’s life, the surviving family second, and friends, third. No two services are the same. Based on Bible scriptures, with prayers and music from the religion of the deceased. This service draws from emotional and inspirational sources, but is not limited to the Bible. Not a religious service. Material is used that is appropriate to the life of the deceased. The amount depends on the distance travelled by the Minister to and from the venue. Words apply to the funeral service and the order in which parts of the funeral service are arranged. A service can be done in any order with many different add-ons depending on the family’s requirements. Humanist or Spiritual services normally have poems and other readings but these can be substitute for songs, prayers and Scripture readings. It all depends on what the family feels is appropriate. Here a brief; historical accounting of the deceased’s life are given as received by the family. 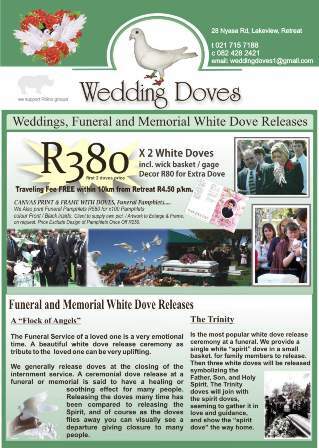 The Obituary read at the service is usually more comprehensive than the one used for funeral notices in the newspaper. It can be written by a family member or the Minister. A formal speech in praise of the deceased. Often written by a family member (or family members) and read by one of them, or the Minister, at the service. The service at the grave side after the funeral service. It is usually brief and often includes the reading of appropriate scriptures or poems and a prayer. Sometimes a song is included. There is usually no committal service for cremation services. A term sometimes referring to the funeral service. 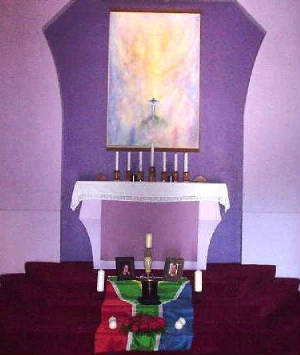 More often it applies specifically to rituals to be conducted at the funeral service and/or at the committal service, by organizations such as the Masons, African Cultures, Eastern Star, military organizations, fraternal organizations, and others. The minister needs to know if any of these are participating in the service so he can coordinate it with his service. Musicians are most of the time volunteering or are hired to perform music at the service. Recorded music is often used either alone, or in conjunction with soloists, at funeral services. 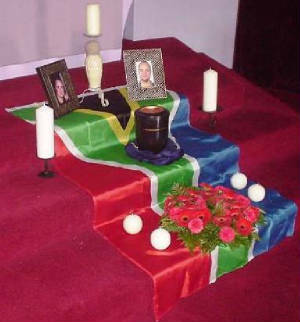 Some traditions use a pall, which is a cloth used to cover or drape the casket. In the case of military veterans, the national flag is often draped as a pall over the casket. The Minister will work closely with those who wish to be involved in the service. Ideally, he will meet with you and anyone you wish to be present to understand your needs to create the service and get to know about the person who has died. This ensures the ceremony will have a really emotional status or personal flavour and be an appropriate remembrance for all. If you are holding the ceremony at a Cemetery or Crematorium chapel: Make sure your Minister is available. It is a good idea to let the Funeral Director know that you wish to use a particular Ministers services before you book a time and date for the service. Ceremonies do not have to be in a Church or Chapel, other locations can be found. There are no rules about this in South Africa, as long as you have permission from the owners of the land or building to be there. Funerals and memorial ceremonies can be held anywhere, in your own home, garden, club, burial sites, golf courses or mountainside. Some sites requires permission from the local authority under whose controls such site might be. Please obtain it in writing before hand. · To join family and friends together for mutual support. · To cope with grief. · To provide opportunity to say goodbye. · To provide recognition of the pain that death brings. · To provide time and place to share memories of the deceased. · To affirm the value of the person who died. · To try to make some sense out of the loss of life. · To find comfort in religious and other affirmations of hope. · To hear the proper words said. We have gathered here today to honor the memory of [name]. Although [he/she] is no longer with us, [he/she] lives on in our thoughts and in our hearts. Each of us—whether a member of [his/her] family or a friend—has been touched by our experiences with [him/her] and each of us has come today to honor those moments. There comes a time for each of us—the final break when the voice we loved and appreciated never speaks again and there is no response from a source that failed us. We recognize today that though the physical presence is gone, the relationship does not end. [name]’s death ends [his/her] physical presence among us, but not our relationship with [him/her]. And so, today, we have come together to celebrate the life of [name]. As we leave here today, let us hold within each of us the many fine qualities and experiences of [name] that have been shared today, using them in our lives to build a better world for ourselves and others.